Residents, who were evicted from unallocated vacant apartments in Nellmapius in Mamelodi East, Pretoria following a court order, say the ANC has committed “political suicide”. On Monday morning, the Red Ants security service evicted hundreds of people from the newly built, but unfinished apartment blocks. Those who were evicted said they had nowhere else to go, and were left sitting on the side of the road with their belongings, looking on as the Red Ants secured the apartment blocks. Several residents told News24 that they occupied the apartment blocks because of government’s failure to provide housing. They added that their evictions are akin to political suicide by the ruling party. With less than a month before the election, the evicted people have vowed that there will be no voting in Mamelodi until the housing issue is sorted out. “No one will vote in Mamelodi. There won’t be voting stations,” said one person who did not want to be named. “The ANC is committing political suicide. We are not going to compromise our votes,” another resident said. 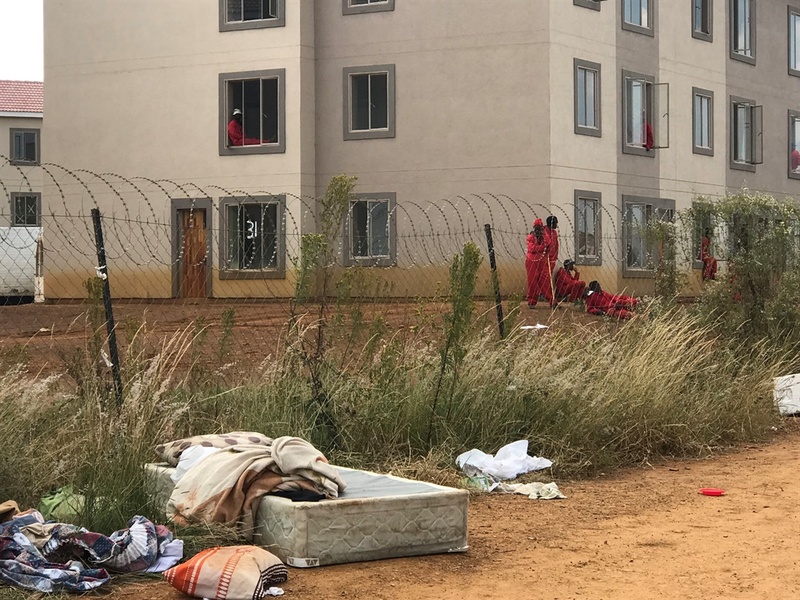 Several of the people who were evicted admitted to News24 that the flats had not been allocated to them, but that they occupied them out of desperation. They added that they were not looking for a handout, but were happy to pay rent, and will even be content with a rent-to-own system. “We came to a point where we wanted to secure this place,” said one resident. Community members said they moved into the units earlier this year after the apartments had been left open and unfinished for around three years. Residents explained that all that needed to be installed were sewage, sanitation and electricity. They said they themselves pay for these utilities to be put in place. Earlier on Monday, the Red Ants, shot rubber bullets at the illegal occupants in an attempt to disperse them. A crowd was gathering in the vicinity of the apartment blocks. A 61-year-old woman standing near one of the blocks was shot in the leg. “We are not fighting with them, but they just started shooting at us,” the woman told News24. One resident said he was waiting with his belongings when the Red Ants took aim. “They [started] shooting us with rubber bullets while we waited for a bakkie to load our stuff,” said one man who also wanted to remain anonymous. Another man who was shot once in the arm and twice in his torso alleged that the Red Ants robbed him of his cell phone during the shooting. Several others claimed that their belongings were either stolen or that they were not allowed to collect the remainder of their goods from the apartments. Following the shooting, a small group of occupants attempted to block Solomon Mahlangu road, but police used rubber bullets and stun grenades to disperse them. The occupants showed News24 a court order granted by the North Gauteng High Court, showing that the Gauteng Department of Human Settlements applied for the eviction order. The eviction order is dated April 24 2018, and states that the occupiers of the apartment blocks should be evicted by no later than May 31 2018. The order also noted that the apartment blocks are unallocated and that the people being evicted have a claimed right of occupation. Spokesperson for the Department of Human Settlements Keith Khoza confirmed to News24 that an eviction order was sought and granted in 2018. He said that the order has not expired. By Monday afternoon, those who were evicted remained outside the buildings, saying that they had no alternative accommodation. Some wondered what they would tell their children once they return from school only to find they have nowhere to live.